Local ambient hero Braeyden Jae and Portland-based Ant’lrd have split a self-titled cassette and synonymous digital release. 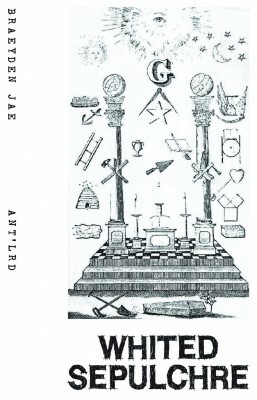 On Braeyden Jae / Ant’lrd, we find two distinct artists attempting to find common ground. Where Braeyden Jae is cool, patient and detached, Ant’lrd is direct, driving and present. Both styles are equally viable, but situated next to each other they act to reveal, more than anything else, the other’s differences. In monochrome, the cover presents a paradox of order and chaos. A conglomeration of figures and patterns relating to geometry, esoteric thought, celestial bodies, life and death, and blue-collar workings stand suspended, giving the impression of a Masonic ritual for the mismatched, though representative, common man. The line separating—but inevitably connecting—these notions of the commonplace and the grand is crossed time and again in image and sound, asking us to refine our definitions of each. Braeyden Jae opens up side A of the album with “Soft Reunion.” Droning sounds, reminiscent of cathedral-echoed organs, fill the track, creating a sense of awe and reverence, while a dissonant static punctuates the piece like a mumbling preacher attempting a sermon. “Endless Endings” creates a certain feeling of freedom with its shiny tones and glittering percussion. Side A is brought to a close by “Inifinty Char.” The song, through its beautifully trailing notes and slender background buzzing, gives the listener the impression of flying, occupying the space between reality and something greater. Ant’lrd is not entirely disloyal to the preceding sounds, and begins side B with “Dream River Artifact I,” a song filled with slow, flanging, air-like movements, discreet grumblings and a clicking at the end. “Dream River Artifact II” contains a sonic womp that speeds up and slows down imperceptibly over percussive glitches, creating a pleasurably moving experience—easily my favorite. Side B closes with “The Dark Between the Stars III,” which ultimately stands as Ant’lrd’s decadently dark contribution to the split—in a somewhat simplified creaking static, a heavenly ringing comprises the majority of the track and, in the last 30 seconds, is overtaken by a new-age beat and progression.